At Shining Hope, we believe that linking different social services is mutually beneficial and more efficient for both programs and the participants themselves. Programs that complement each other – such as our water tower, which provides clean, affordable water to the community, and our community health program of our clinic, which leads health talks on sanitation practices– work better together, and the result is a greater impact for the people that use our services. 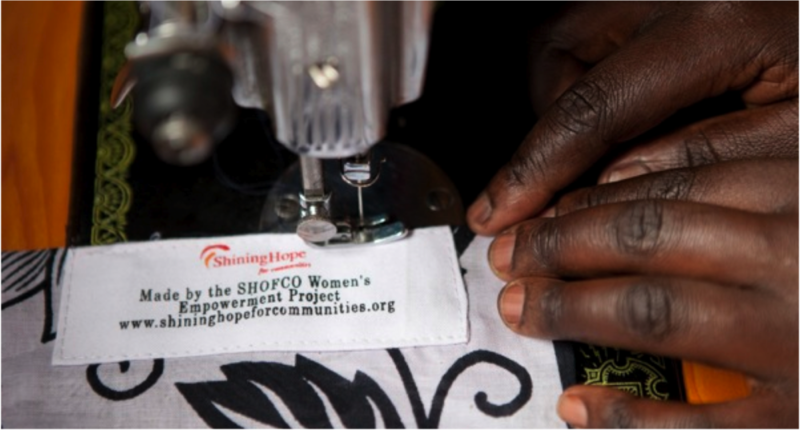 Beyond efficiency and a greater impact, however, linking our programs highlights and builds the strong sense of community that exists within SHOFCO. This was perfectly illustrated earlier this year, as the SHOFCO Women’s Empowerment Project (SWEP), a group of women living positively with HIV who receive an income from making and selling bags, bracelets, jewelry, wallets and more, linked up with The Kibera School for Girls (KSG) for an amazing project: new uniforms for our pre-kindergarten students! Pre-K Class One with a big thumbs up for their new uniforms! The SWEP women (many of whom have been involved with SHOFCO since KSG was built or are parents of girls at KSG!) had been working since the start of the new school year to sew our younger students uniforms — KSG’s vibrant blue dresses that are paired with a red sweater. The SWEP team was energetic about taking on this exciting long-term project, which allowed them to deepen their relationship with KSG while providing a significant source of supplementary income they could bring back home to support their families. The classes look incredibly “smart” in their shining blue and red uniforms. If you’re walking through Kibera around 3:30pm, when our pre-k and kindergarten girls leave school for the day, you can’t miss them running and skipping towards home or giggling in a big pack, arms wrapped around each other. Kibera School for Girls’ students have a certain jump to their step as it is. Now, with the beautiful, radiant uniforms made by the women of SWEP, there’s no way you could miss them.